Does HandBrake Remove DRM from DVD? How to Rip a DRM-ed DVD with HandBrake? How Can I Use HandBrake to Remove DRM from DVD? 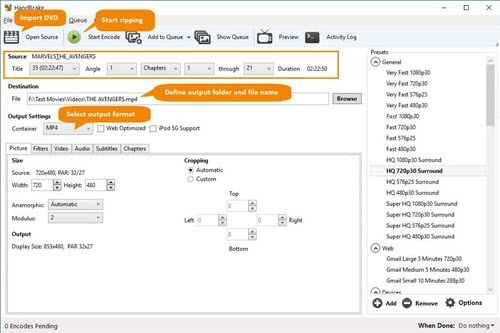 HandBrake, this expert open-source and cross-platform DVD/video transcoder, takes a top place on the free DVD ripper chart through years of development. In December 2016, HandBrake 1.0.0 was eventually released with a major upgrade supporting VP9 video encoding, Intel QSV encoder and delivering other giant improvements to enhance transcoding speed and output quality. In version 1.2.0, HandBrake added the support of NVIDIA NVENC to accelerate H.264 and HEVC encoding leading to rip an unprotected DVD to MP4/MKV more quickly. But how about encrypted DVDs? Can HandBrake remove DRM from DVD? If it can't, is there another way to rip a decrypted DVD? Let's dig out answers one by one. WinX DVD Ripper Platinum - Remove various copy protections from DVD, like CSS, region code, FBI Warning, Sony ArccOS, Disney DRM and other schemes on latest DVD movies, 99-title DVDs, workout DVDs etc. The support of Hardware Acceleration empowers this best HandBrake alternative to utilize Intel, NVIDIA and AMD GPUs to achieve an extermely fast DVD processing speed while keeping nearly lossless quality. How to Remove DRM from DVD with HandBrake? Get Help From libdvdcss. No matter how many upgrades HandBrake brings, it still can't circumvent DVD copy protections. So, is it impossible to use HandBrake to remove DRM on a DVD? Actually, you have the chance to rip a CSS-encrypted DVD with HandBrake if installing libdvdcss. What is libdvdcss? It is a library designed for accessing DVDs with Content Scramble System (CSS) encryption, which is widely used by free player software to decode protected discs. It is available for Windows, macOS, Linux and more platforms. Using it, HandBrake is able to remove DRM on DVD and achieve DVD ripping successfully. So, how to use HandBrake to rip an encrypted DVD with DRM removal? Step 1. Download and install libdvdcss for HandBrake. After the correct libdvdcss version is downloaded, copy the dll file to HandBrake installation folder. Now, libdvdcss is successfully installed on your computer. Step 2. Launch HandBrake. If you have inserted the DRM-ed DVD into optical drive, HandBrake will automatically show the source selection panel. You just need to choose the DVD. If not, click Open Source to access the source selection panel. Step 3. DVD will soon be loaded. Sometimes, HandBrake helps detect the main title while some other times you should manually select the main title. After confirming the title, click Browse button in Destination section to define folder to save output file and the name. Step 4. In Output Settings section, select MP4 or MKV as output format. In addition, various presets are listed on the right of HandBrake window. You can pick any preset (for web, for devices and more) depending on your needs as output. Step 5. Click Start Encode to remove DRM on DVD and rip the encrypted DVD to MP4 or MKV with HandBrake. You can adjust video/audio parameters, like codec, bitrate, frame rate, resolution and more to achieve an ideal effect of the resulting file. HandBrake empowers you to add/delete audio and subtitle tracks. You can also import external subtitles for a foreign DVD. If there is no demanded preset provided by HandBrake, you can add a personalized preset by customizing preset name, picture size, audio and subtitles. It's a Bit Complex to Remove DVD DRM with HandBrake? Follow Easier Alternative Way. It is not a simple task to install libdvdcss for HandBrake to remove DRM, especially on Mac. Errors like "won't install libdvdcss", "fails to rip encrypted DVD even though libdvdcss is installed" happen from time to time. Is there an easier way to remove DRM on DVD? The best HandBrake alternative, WinX DVD Ripper Platinum is the answer. WinX DVD Ripper Platinum is proud of its ability to support all kinds of DVDs, from newly released DVD movies, workout DVDs to old or even scratched DVDs. It can help rip DVDs to MP4, AVI, WMV, MOV, FLV, 3GP, iPhone, iPad, Android, Windows Mobile, Xbox, Sony PlayStation etc, while keeping original quality. Inbuilt hardware accelerator (Intel QSV, Nvidia NVENC) featuring stepped-up video encoding/decoding/processing plus Hyper-threading tech and Super Encode Engine produce an ultimately fast speed (about 10 minutes to rip a 2-hour movie). It has an intuitive but modern design leading you to learn how to get started quickly. Following this tutorial, you can remove DRM from DVD as easy as pie. 1. Download and install WinX DVD Ripper Platinum on your computer. 2. Insert DVD into optical drive. Launch WinX DVD Ripper Platinum and click DVD disc to import source DVD. 3. All titles of DVD will be loaded soon. Main title is auto-checked. Meanwhile, Output Profile window appears. 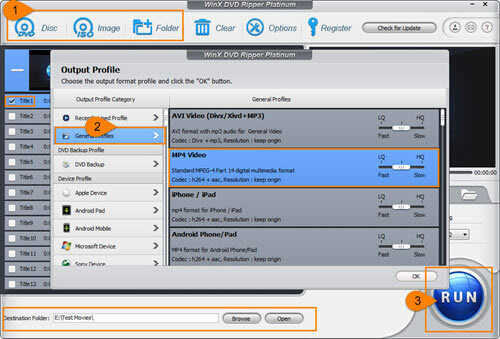 Select one format as output format, for example General Profiles > MP4 Video. Click OK.
4. Click Browse button to define destination folder and click RUN button to start DRM removal. After all is done, you can get a crisp video ripped from protected DVD in the destination folder.